ONE PART OF THE caravan that often gets taken for granted, I feel, is the chassis. I suspect this is because the chassis is out of sight and, in many cases, it’s simply a bit of steel. In fact, the chassis provides several vital functions. It performs as the foundation for the entire caravan construction and supplies both the tow hitch connection point and suspension mounting points. In Caravan World, there is some jargon associated with the descriptions of chassis – box-section, RHS, DuraGal, SupaGal, hot-dipped galvanised, etc. – and I sometimes wonder if readers understand what they actually mean. This article will endeavour to explain a few of these terms, and investigate some of the more controversial issues. Most caravan, camper trailer and fifth wheeler chassis are made of steel, usually rectangular hollow section (RHS) steel. 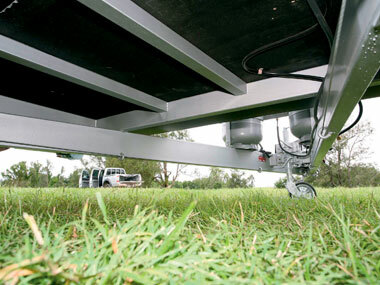 There are several specialist builders, like Vic-based G&S Chassis and FP Chassis, but there are also a number of caravan manufacturers that build their own, using outsourced components like towing hitches and suspension components. 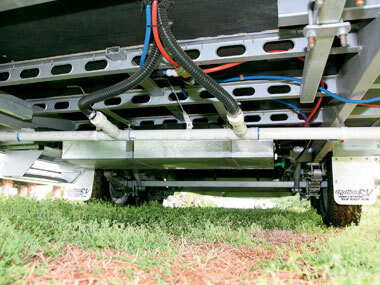 Generally speaking, a normal, Australian-built, on-road caravan would have two 100x50mm (4x2in) rails with cross pieces of either the same size or 50x50mm (2x2in) steel, or punched-hole C-section steel, welded together in a ‘box section’. In some cases, C-section is used as the main rails. The drawbar, or A-frame as it is sometimes called, is either welded to the front of the chassis or runs right back to the front suspension mounts. In a variation of this setup, the drawbar rails are actually part of the main chassis, and run the entire length of the van. 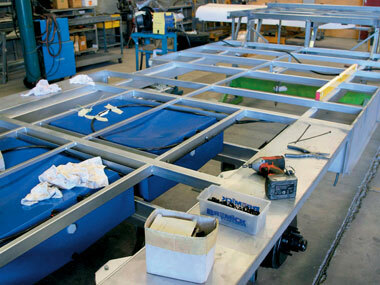 There may be a second chassis above which is fully welded, or laminated, to the lower rails. 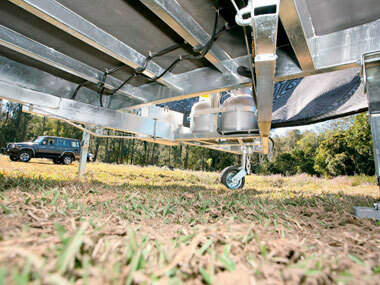 In another variation found in heavy-duty offroad vans, 150x50mm (6x2in) rails are used. Undoubtedly, the advantage of the steel construction is its strength, while a disadvantage, particularly with the double-railed vans, is that the weight of the steel becomes an engineering factor in itself. The British/European-style chassis looks very different to the Australian style, as there are just two lightly-engineered main rails with a drawbar, and one or two cross members. The two manufacturers we have seen in Australia are Al-Ko (under Adria, Bailey and Swift caravans) and BPW (under Geist caravans). Although many of the importers do have the chassis especially modified for this country, this form of chassis construction is much derided as being unsuitable for Australian conditions. However, conditions in this country vary and, for a traveller who never goes offroad, having a chassis built like the Sydney Harbour Bridge is not necessarily a prime requirement. One of the differences with this style of chassis is that the actual caravan body is often monocoque in its structure, meaning it does not rely on the chassis for structural strength. At the workshops of the former Geist importers, I have seen the van body lifted entirely off the chassis with no resulting damage in order to do some chassis modifications – this is not something that can be done with most Australian-built vans. One advantage of this type of chassis is that it is considerably lighter in weight than the box-section style (certainly an issue in the RV world), but it may not be suitable for offroad conditions. Hot-dipped galvanising is the process of coating iron, steel or even aluminium with a thin layer of zinc. This is done by passing the metal through a bath of molten zinc at a temperature of around 460°C. When exposed to normal atmosphere, the zinc reacts with oxygen to form zinc oxide, which further reacts with carbon dioxide to form zinc carbonate. The result is a protective cover that is fairly strong and prevents further corrosion of the steel below. Hot-dipped galvanised steel is quite easily identified by the crystalline-patterned surface on the steel that is sometimes called ‘spangle’. DuraGal is a proprietary process, whereby rectangular hollow sections (RHS) of steel are hot-dipped galvanised in line with the definition above but the external zinc has a surface coating applied to improve resistance to white rusting and to improve the adhesion of paint or powder coatings. An important point to note is that the RHS steel is only galvanised on its external surfaces. DuraGal steel, required to be manufactured to Australian Standard 1163, comes in two grades: C35OL0 and C45OL0. SupaGal is very similar to DuraGal, except that the RHS sections are galvanized on both the external and internal surfaces. Naturally, it’s more expensive but the owner of the process, OneSteel, reckon that corrosion starts on the inside, and serious rust could be forming without any visible indication. SupaGal is manufactured to Australian and New Zealand Standard 2312. All of the above terms are used in reference to chassis construction but one in particular has become generic, and is understood to mean something different from what is implied. As can be seen from the above, all chassis steel is hot-dipped galvanised, but in the cases of DuraGal and SupaGal, the galvanising happens before the steel is welded up, meaning that all the welded joins have to be cleaned and zinc-coated after the chassis is constructed. When the term hot-dipped galvanised is used, it is normally taken to mean that the hot-dipped galvanising happens after the chassis is constructed. As you might imagine, a much larger tank of molten zinc is required for this process, so it is more expensive and it can add up to 50kg to the weight of the chassis. much tougher than conventional paint, but possibly not as effective as galvanising along Australia’s coastal areas. Although steel is most often used in caravan, camper trailer and fifth wheeler chassis construction, there are a few manufacturers around who use aluminium almost exclusively. One of the major advantages of using aluminium is the reduction in weight when compared to steel, and the lack of a need of something like galvanising to protect it. Using aluminium does require a good understanding of its properties and considerable skill from the tradespeople involved. This is something that steel users are quick to point out. I know several manufacturers across all sectors of the RV industry who have successfully used aluminium in their designs, including one who has developed a relatively lightweight offroad van. Proponents of aluminium chassis are always very quick to point to the boating and aircraft industries as examples of successful aluminium use, especially in the latter case, where material failure would be catastrophic in something like a Boeing 747. As with most things, there are advantages and disadvantages to all the different methods, materials and protective finishes used in chassis construction. The pros and cons are an individual matter, but hopefully you now have a better understanding of chassis terminology. It pays to be knowledgeable when asking dealers and manufacturers the right questions about why they do what they do.